Here you will find how create a document with interactive Form and Fields controls. In this code example, we will add some form controls to our document: a check box, a text box, and a drop-down list. Our controls are: Full Name, BirthDate, Gender, Married, Phone. /// Generate document (PDF) with forms and fields.
''' 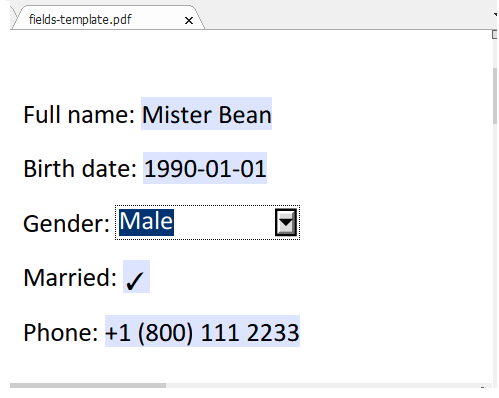 Generate document (PDF) with forms and fields. fullNameFieldData.HelpText = "Enter your name and surname (trimmed to 50 characters)." birthdateFieldData.HelpText = "Enter your date of birth." genderFieldData.HelpText = "Select your gender." marriedFieldData.HelpText = "Mark as checked if you are married." salaryFieldData.HelpText = "Enter your phone number."